BEJING, May 13 (APP):Pakistani students set up a booth, presented stunning cultural performance and served delicious food to mark an international cultural day at China’s top Tsinghua University here on Sunday, giving the Chinese and international audience a rare glimpse of their rich culture, customs and taste of traditional delicacies. The opening ceremony featured a keynote address of school leadership followed by colourful cultural performances, traditional folk music and dances, as well as presentation of traditional foods. Attired in vibrant costumes of their respective provinces, the young and talented Pakistani students presented traditional foods, including Biryani, Kheer, Sharbat and other delicacies to the visiting guests. They also mesmerized the gathering with their exquisite and stunning performances including traditional Khattak, Luddi and Bhangra dances. Some students attired in traditional dresses painted Pakistan’s green and white national flag on faces of Pakistani as well as international students during the carnival. Mumtaz Zahra Baloch, deputy head of mission, Pakistan embassy Beijing graced the occasion by visiting Pakistani booth. She attached great importance to deepening cultural exchanges with China in a bid to foster healthy and mutually beneficial bilateral ties. Suleman Mahsud, education attaché, Pakistan embassy, Beijing in his remarks appreciated Pakistani students for their untiring efforts to introduce culture of different regions of Pakistan to Chinese and international audience in an organized manner. 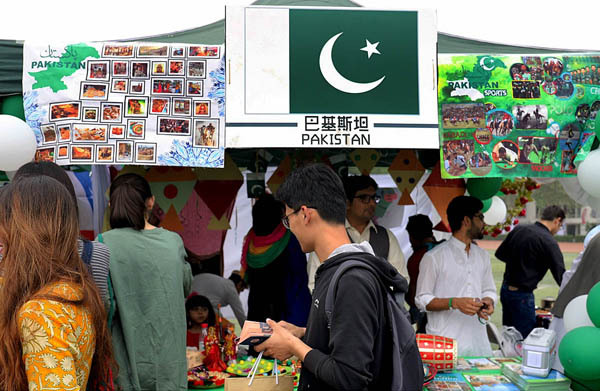 The members of the Pakistan Students Association Tsinghua University (PASA) had decorated it booth with photos, paintings, artefacts besides serving Pakistani delicacies to the local and international students. Muhammad Fahad, a student of PhD Automotive Engineering commented that the cultural event provided an excellent opportunity to display and strengthen our cultural bonds with Chinese students. The show drew waves of applause from the audience and exposed the visiting guests to Pakistani culture and exquisite food. Abbas Haider, a student of PhD Civil Engineering remarked that a large number of international students visited our stall and took keen interest in our culture and also appreciated our food offered free during the entire day. They termed the event as a unique experience of witnessing the diversity of cultural heritage of different countries, especially Pakistan. More than 100 different countries and regions including European, Latin American, South Asian, East Asian, Central Asian, African and Arab nations participated in the event providing a perfect environment to promote international and intercultural exchange by bringing together Chinese and international students. The students exhibited their talent by performing and presenting traditional music, songs, and display of traditional instrumental music. The festival also attracted guests from outside of Tsinghua’s campus. In fact, over 6,000 people attended the event. The international community from all over Beijing came to Tsinghua to share the local foods and customs of their home countries and regions.